Safety is critical to the responsible delivery of energy. We develop and operate our facilities with the aim of preventing any incidents that may harm our employees and contractors or nearby communities, or cause environmental impact. 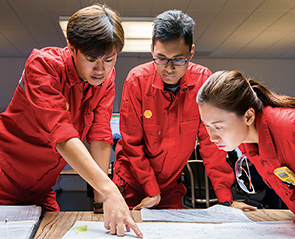 We continue to build a culture where people understand their role in making Shell a safe place to work. Operating safely is central to the way we deliver energy and products to our customers. Our goal is for all of our facilities to operate with no leaks or incidents that may cause serious injury to our employees, contractors or neighbours. We have a global set of standards that detail the safety risks that need to be managed and who is accountable. This is called our Health, Safety, Security, Environment and Social Performance (HSSE & SP) Control Framework and it defines the controls for managing our operations safely and responsibly (see “Our governance and standards”). All Shell employees and contractors, and those at joint ventures we operate, must follow our safety rules, intervene in unsafe situations, and respect our neighbours and the environment. These expectations and controls are the foundations of the proactive safety culture that we nurture in our workforce. Our Life-Saving Rules and annual global Safety Day promote a culture where everyone takes responsibility for safety. The mandatory 12 Life-Saving Rules cover expectations on managing the most critical safety risks. Lives can be lost when these are not followed. Since their implementation in 2009, there has been a notable reduction in the number of fatalities in our operations. Our annual global Safety Day is an opportunity for all employees and contractors to spend the day sharing ideas and good practice, and planning ways to improve our performance in safety. We often work in joint ventures with national and international energy companies. When we operate the venture we apply Shell standards that cover HSSE & SP. The standards for these joint ventures also include the Shell General Business Principles and the Code of Conduct. Where we are not the operator we encourage our partners to apply materially equivalent standards. For further information about our joint ventures, contractors and suppliers see “Contractors, suppliers and joint ventures”.